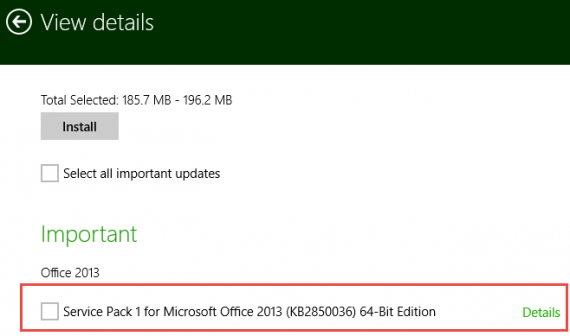 Microsoft has released Service Pack 1 for Office 2013 suite. SP1 for Office 2013 comes with quite a few updates to improve security, stability and performance of each product in the suite. The service pack includes product updates and hotfixes all the way from the initial release of Office 2013 until now (From December 2012 to January 2014). If you are an Office 365 user, you will be using the latest version of Office 2013 apps by default. There is no need to update. But the Desktop users will need to download and install the Service Pack 1 either by downloading it through Windows Update (KB2850036) or by downloading it from the direct download links below. The current version of Office 2013 is 15.0.4420.1017. And after installing Office 2013 SP1, the version will become 15.0.4569.1506 or higher. You may see these version numbers in the Programs and Features control panel app. Office 2013 SP1 can be installed on Windows 7, Windows 8, Windows 8.1, Windows Server 2008 R2, Windows Server 2012 and Windows Server 2012 R2 Operating Systems.